Living in New York City, we have had the opportunity to eat some really good food. Between the epic chocolate chip cookies from Levain Bakery on the Upper West Side and the famed kouign amann from Dominique Ansel's famed bakery, our delicious sugar daze made us foolish enough to think that we have eaten the best desserts this country has to offer. Prantl's burnt almond cake isn't impressive in height. It's not made out of chocolate (which is usually a must). And it isn't trying to push the limits of pastry and redefine what cakes are. 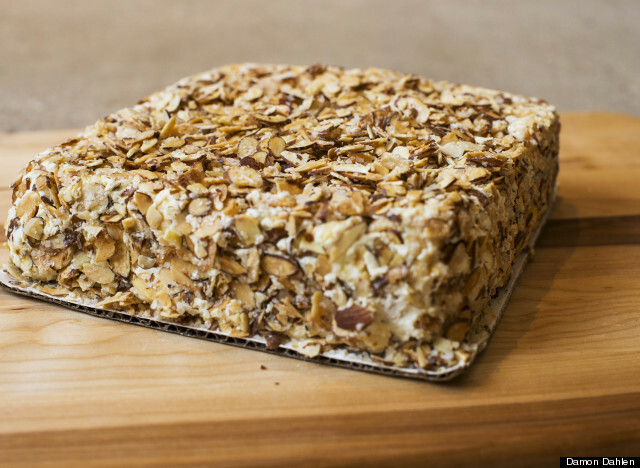 It is just a damn good cake -- and taking a bite out of one is like reaching into the sky and stuffing a cloud into your mouth. To say that the burnt almond torte is light and airy doesn't even begin to describe the texture of this cake. It is beyond that. This cake is so airy it tastes like the idea of a cake, one that can only be tasted in the best of dreams. 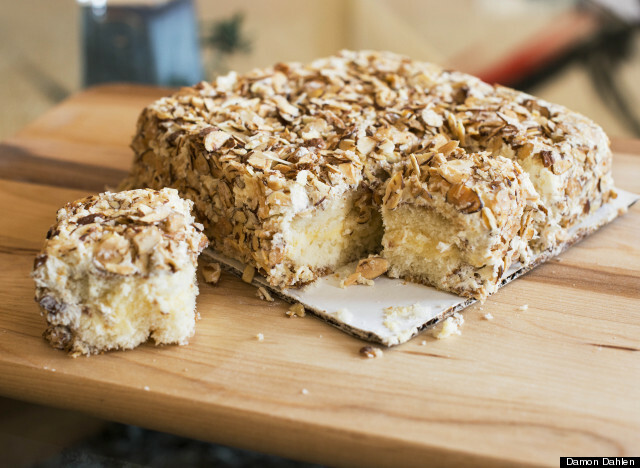 Only it does exist in real life -- in Pittsburgh, PA, to be exact-- and it is frosted with the lightest of buttercreams (of course) and then dressed in candied toasted almonds. The contrast of the sugared almond slivers and the cloud-like cake is EVERYTHING. Oh, and did we mention the thin layer of custard in the middle and the large flakes of sugar on top? This is the kind of cake that will have you belly up to the kitchen counter, forgoing the civility of plates and diving in fingers first. When Bon Appetit named Pittsburgh the best new food city of 2014, they couldn't have been more right. Only it's not because of the surge of hot new restaurants opening up. No, it's because cakes like this are made there -- and it's time people know about them. If a trip to Pittsburgh is not in the near future, you can still get your hands on this cake because, lucky for you, they deliver. Here's one more look, just because.